Today was a scheduled SRC meeting to vote on the acceptance or rejection of 39 charter school applications. As we arrived at the Philadelphia School District Building for the public meeting, we were immediately sent to the “overflow room”. About 50 people were present, both public and charter school advocates, and one school police officer. A woman, a member of APPS, Ilene Poses, had a sign around her neck and signs on the table in front of her. Her sign was referencing the Sunshine Act, which mandates that the SRC must give ample notice of meetings, something that did not occur when the SRC cancelled the teachers’ contract back in October. Two school police officers informed her that she was not allowed to have signs, upon her reasonable question of “why?”, school police chief was called into the room to resolve the matter. The police chief, Chief Holmes aggressively berated the woman and ripped the sign out of her hands. The sign hit her in the face as he violently took it away from her and threw it. As he threw the sign on the floor, he ordered other officers to “get her out of here”. The school police moved tables out of the way to surround the woman. PSU members in the room and her supporters asked officers what was her charge and what was the problem. Dozens of others in the room wore KIPP shirts, given to them by the charter school operator. She asked why they could display their opinion on their shirts, while she was not able to have a sign that expressed her own. “What’s the difference between cotton and paper?”, she asked. 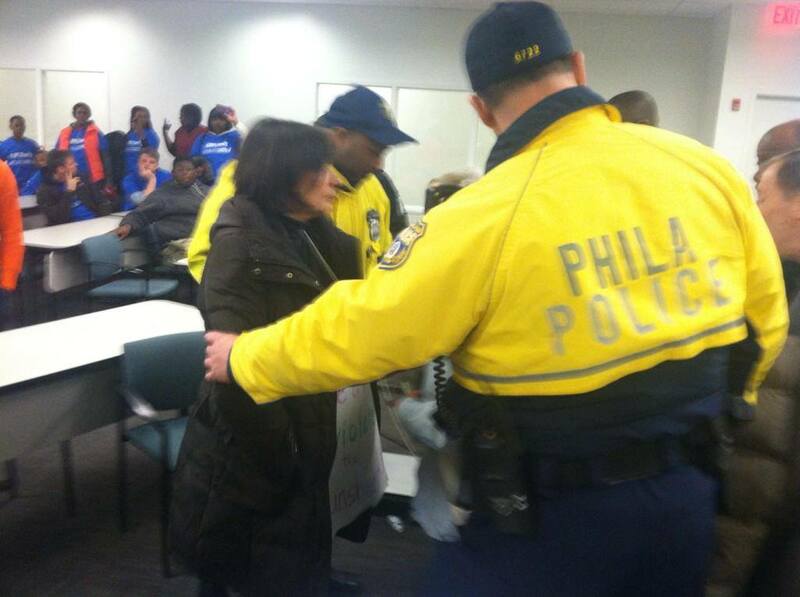 City Police, called into remove Ilene, violently grabbed her out of her seat. She resisted, she argued back. After city police accused the woman of being “hostile” members of the Philadelphia Student Union told the officers, “What is hostile is the closing of our schools, not holding a sign. What’s wrong with a sign? It is our first amendment right to express our opinion.” Students were not listened to and were asked to leave the room. There were no press in the “overflow room”. This event did not occur in a vacuum. This event occurred after the SRC cancelled the teachers’ contract with basically no warning. This event took place after Sylvia Simms screamed at PSU members, lied to the press, then suffered zero repercussions. The School District is in millions of dollars in debt, and the SRC gets to make decisions that do not serve our communities. The School District is now a militarized zone, where signs are no longer allowed and freedom of speech is eliminated. There is no deliberation, there is only the political theater of the SRC, as we can only expect from unelected officials who consistently act on behalf of wealthy individuals and are taking steps to systematically destroying public education. We have officially reached a very sad point in the education battle in Philadelphia. Charter parents were escorted upstairs to fill the empty seats in the main room, and PSU members and the women were escorted out. If this is not proof that there is NO negotiating with the School District and it’s police force; it is time to fight for our schools as if our lives…and freedom, depend on it. The extreme disrespect of community members in this instance by the School District of Philadelphia is an appalling example of the course that this district has taken. A course which will lead us to a completely privatized district in the foreseeable future. The SRC has not provided a meaningful plan for providing a quality education amidst this budget deficit. The SRC is political theater. The SRC only listens to the input of wealthy individuals and power players, such as the Philadelphia School Partnership, not community members, students, parents and teachers. 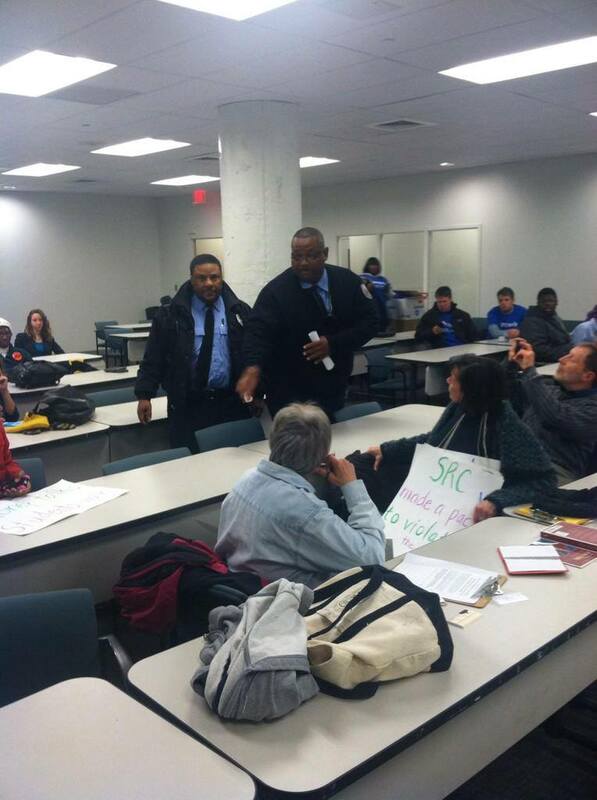 The SRC must be abolished and the School District and City of Philadelphia must be held accountable.